Languedoc is one of the biggest wine regions in the world. It runs along the Mediterranean coast from south of Toulouse to the suburbs of Montpellier. Wine like anything in life is subjective. It’s not up to connoisseurs to tell you what you should like and what you shouldn’t. Likewise, you should be able to take recommendations and make up your own mind! The fun is in the trying and why not try to learn as much as possible when it comes to wines. They very much go hand in hand, don’t they? Like Jeeves and Wooster or Trump and his toupee. France falls under ‘Old World’ wine as opposed to ‘New World’ wines from Chile, New Zealand and so on. Winemakers in France are steeped in tradition passed down from their forebears. They are more concerned with their terroir and see their wine as something that can only come from their land, cultivated in the way they are taught mostly under AC (appellation controlee). To them wine is made by the land, it is not controlled by man. Nowadays wine tourism is more of a thing in France. Education has also improved with winemakers now receiving more formal education in wine producing where they are starting to understand why the make wine as well as the tradition of wine-making. Before it was just assumed; France is wine so why bother with the marketing. In the last decade they have pushed tourism, chateau packages and vineyard tours/lunches and it has been of huge economic benefit. In fact, figures from 2016 showed 10 million visitors came to France for wine-associated tourism which was up 2.5 million from the decade previous. With this in mind let’s explore one region – Languedoc-Roussillon. Languedoc is one of the biggest wine regions in the world. It runs along the Mediterranean coast from south of Toulouse to the suburbs of Montpellier. The vines that grow here get long periods of sunshine and a lot of wind from welcoming sea breezes at night. Azure waters of the Med! The climate means the vines tend to escape disease compared to wetter regions in the north. This also signifies a recent shift from mass producing wines to now becoming better known for producing organic wines. These wines have fewer chemicals and being sulphite free the hangovers tend to be a little easier. 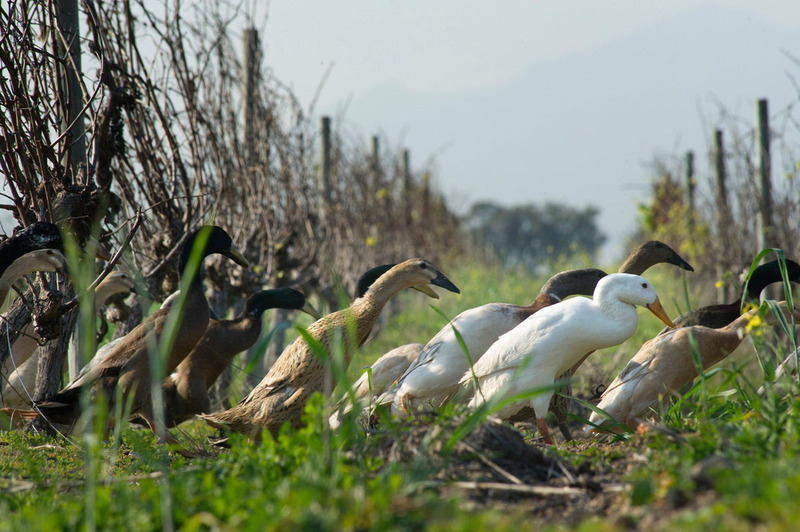 Something farmers might do is bring in small sheep to eat the grass and weeds between vines, using nature to work with and increase the biodiversity of their vineyard. Currently we are neighbours to a farm in Italy using ducklings to do the same thing! As well as a big push for trendy organic wines, the region has all the makings of a great wine producing area with lots of soil varieties that help to create a plethora of tastes within their products. Languedoc wines are mostly about blends. They have so many grapes growing together they tend to go for a blend rather than the single varietal. You don’t have to go straight to the source to get some lovely options from this region. So, if you’re in the supermarket and you’re trying to choose a bottle of wine here is a quick go to for Languedoc-Roussillon. Coteaux du Languedoc & Vins de Pays is what you’re looking for! In our Montpellier city guide we recommended Chateau de Flaugergues which sits proudly on the edge of an industrial estate, resisting the encroaching city with its beauty and elegance. The vines here have been cultivated since Roman times and the gardens are made up of five areas – the vines, an olive tree avenue, classical gardens, terraced flowerbed and a park.